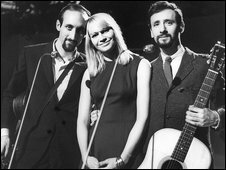 Mary Travers, one third of the hugely popular 1960s US folk group Peter, Paul and Mary, has died after a battle with leukaemia aged 72. A statement on the group's website said the singer succumbed "to the side effects of one of the chemotherapy treatments" she was undergoing. She had been suffering from leukaemia for several years. Peter, Paul and Mary had hits including If I Had a Hammer, Lemon Tree and Puff, The Magic Dragon. They became known for their mixture of liberal politics with folk music that won them a loyal following of fans and also five Grammy Awards. Bandmate Peter Yarrow said that in her last months, Travers handled her declining health "in the bravest, most generous way imaginable". He added that throughout her long career, Travers sang with honesty and complete authenticity. "I believe that, in the most profound of ways, Mary was incapable of lying, as a person, and as an artist - that took great courage, and Mary was always equal to the task." Noel "Paul" Stookey, the trio's other member, praised the singer for her inspiring activism, "especially in her defence of the defenceless." "I am deadened and heartsick beyond words to consider a life without Mary Travers and honoured beyond my wildest dreams to have shared her spirit and her career," he said. Travers was an outspoken supporter of the civil rights and anti-war movements. The group travelled the world and frequently appeared at political rallies and demonstrations, including the March on Washington in 1963. Travers kept up her activism after Peter, Paul and Mary broke up in the early 1970s. She performed as a solo artist before the trio later reunited for benefits and other concerts. She underwent a successful bone marrow transplant to treat her leukaemia and told The Associated Press in 2006 she was "feeling fabulous". But by mid-2009, Yarrow told a Washington radio station that the singer's condition had worsened again and thought she would no longer be able to perform. Travers is survived by her husband, Ethan Robbins and daughters, Alicia and Erika. In 1983, Peter, Paul, & Mary performed at Pier Six in downtown Baltimore. Following a wonderful concert, my wife Betsy and I were walking back to our car and singing "The Times They Are A-Changin'" to ourselves. All of a sudden, we hear a familiar voice singing beautiful harmony in the background. We stop and look around, and coming up quickly from behind us was Mary with a big smile on her face. Betsy and I were in total disbelief that this was actually happening to us. It was kind of like winning the music lottery! I am one of the three members of Portland, Oregon based folk group 'Rite of Spring'. Certainly inspired by the music of PP&M, we recently shared the stage with Peter Yarrow. Truly the end of an era for us - so sad. Pater had told us she was holding her own earlier this year, and we hoped she had some more quality time left. Our sincere condolences to her family and Paul and Peter of course. I attended numerous PP&M concerts, but when I was in my 3rd year at university (1969), I met briefly all three members of the group. I was in awe at how friendly all three were. Peter and Paul were funny and extremely intelligent. Mary was incredibly beautiful, and immensely friendly. I am a folk singer like PP&M, so meeting all of them was a dream come true! Never in my wildest dreams did I believe that I would ever meet even one of the three in person! But, on that concert night I did meet all three of these amazing people / musicians! I was in America on a four month 'gap' in 1963 and managed to catch PP&M in concert at the Watergate Theatre in D.C. very close to the building of later notoriety. And the music was uplifting, all the hits and more. Some of Mary's comments, mild today but wildly radical in the context of time and place, caused rumblings among a few of the sell-out crowd but the scent of freedom, whatever that illusory beast is, was in the air, a scent that grew stronger a week or so later when I saw her again in D.C. This time the venue was a bit more expansive - the Freedom March on August 28 when Martin Luther King revealed to us his great dream. What more fitting setting could there have been for PP&M and their songs of protest and hope? 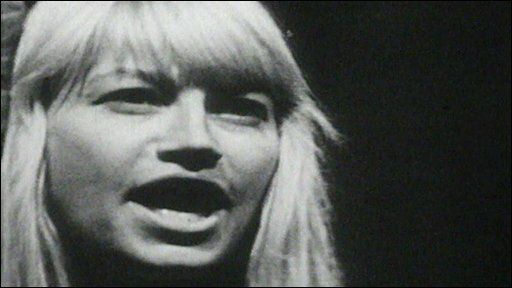 Mary Travers was a lovely woman with a voice to match her stunning looks, a voice like that bell she sang about in 'If I Had A Hammer'. I hope she rests easy. Met P,P&M at stage door of Colston Hall, Bristol 1964. for autographs. They have been the biggest musical influence of my life. Immensely talented and professional group whose influence goes much further than is recognised. I did not meet her face to face but on a trip to Las Vegas three or four years ago Peter, Paul & Mary reformed for a re-union concert and I was lucky enough to be in the right town at the right time to see it. Not the same tall woman of early years with the long swishing blonde hair, and she was suffering a bad hip but the sound, magic, and for me the adrenaline, was still there. Something that should not be over-looked is that without PP&M there would have been no Bob Dylan. It was PP&M that took the unmusical gravel of Dylan, found the music in it and expounded the rhetoric and magnitude of his early work. I was singing along with their songs even before I could read, this was in Berkeley, California in the early 1960s. Their simplistic music (two guitars, three brilliant singers) permanently influenced my taste in music, later Mary's political activism impressed me. This is like losing a favourite aunt. So, another icon of my youth has passed on. I still have all my Peter, Paul and Mary albums and play them often, along with Joan Baez, Judy Collins, Bob Dylan, Carole King and James Taylor. The music of the sixties was so real and relevant. It changed the world and it changed us. Good bye Mary and thank you!